The best way to get to know a community is by scheduling a tour. See the facilities, meet the staff and residents, and get a feel first hand what it's like to live at Aegis of Pleasant Hill Assisted Living. At Aegis of Pleasant Hill, we strive to make our residents lives easier through our dedicated staff by providing numerous daily regular services such as housekeeping, linen service and home maintenance. We adjust the level and amount of care given to each resident based on their personal preferences and needs. 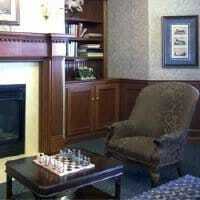 Our residents also choose from the many educational and recreational programs we offer. Many of our units include kitchenettes, and all are equipped with emergency call systems. For personal appointments or events, transportation is available. We are a pet-friendly community, and we offer some pet services. Our specially trained Medication Care Managers offer assistance for members of our community that require it. Residents enjoy their meals in our formal dining room and have access to the private dining room for special events or visiting family and friends. Additionally, room service can be provided. Our beautiful library has plenty of seating for enjoying a good book in comfort, and is a great place to play a game of chess or cards. The outdoor garden and courtyard area has shaded benches for viewing the flowers and our fountain. Residents who enjoy music often have the opportunity to experience live piano playing in the Grand Room. Our exercise options include pilates, walking club and yoga as well as other programs. Our full-time Social Director schedules weekly and monthly art classes, social events and recreational activities. We invite individuals looking for an independent, assisted living or memory care provided to come and experience Aegis of Pleasant Hill.